The cask (white cylinder) on its cradle (yellow) being loaded onto a railcar in Baltimore. The white box behind the cask houses two data acquisition boxes, 20 batteries, and scores of cables that deliver data from sensors to the data acquisition system. Nuclear power provides nearly 20 percent of the nation’s electricity. Nuclear fuel generates power for about six years, after which the spent nuclear fuel (SNF) rods are moved from the reactor into a pool of cooling water. Once the SNF has cooled sufficiently, it’s ready to be moved to long-term storage. A permanent SNF disposal facility has yet to be designated. In the meantime, PNNL researchers are part of a team investigating potential risks posed to SNF during normal transport—including measuring the stresses SNF might experience. 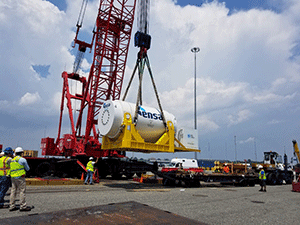 Supported by the U.S. Department of Energy’s Spent Fuel and Waste Science and Technology program, they recently completed a major milestone: an international journey to gauge mechanical loads (strain and vibration) on various system components. Sailing on a cargo ship across the Atlantic to Baltimore, Maryland. Return by railcar as far as St. Louis, Missouri. In all, the data acquisition system collected nearly 6 terabytes of data. These results will be used to quantify the loads on surrogate fuel and then to estimate the loads on actual spent fuel. This will deepen our understanding of the risks of damage to SNF during future handling and transport. The data can also be used to inform Nuclear Regulatory Commission regulations on the transport of SNF, and industry can use the data to better understand the performance of storage and transportation casks. The international team includes PNNL, Sandia National Laboratories, Equipos Nucleares, S.A. (ENSA) and ENRESA (Empresa Nacional de Residuos Radiactivos, S.A.) of Spain, Transportation Technology Center, Inc., Korea Radioactive Waste Agency, Korea Atomic Energy Research Institute, and KEPCO Nuclear Fuel.